FIGURE 1.9. Soil microaggregates, across five orders of magnitude, beginning at the level of clay particles, through plant and fungal debris, up to a 2-mm diameter soil crumb (from Tisdall and Oades, 1982). 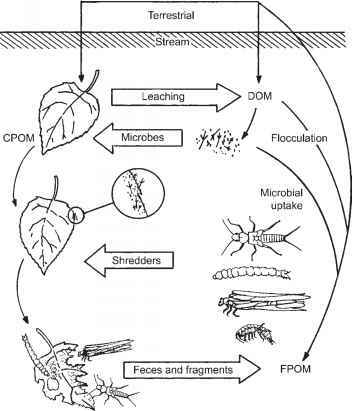 including the influence of macrofauna as ecosystem engineers (Bal, 1982, Jones et al, 1994). We would add a fourth dimension, that of soils and sediments as repositories or libraries of DNA. In Siberia, several permafrost cores dating from 10,000 to 400,000 years old have yielded at least 19 different plant taxa, as well as megafauna sequences of mammoth, bison, and horse (Willerslev et al., 2003). Temperate cave sediments from New Zealand yielded 29 taxa characteristic of the prehuman environment, including two species of ratite moas. These genetic records of paleoenvironments will add to our understanding of past ecosystem structure and, possibly, function.